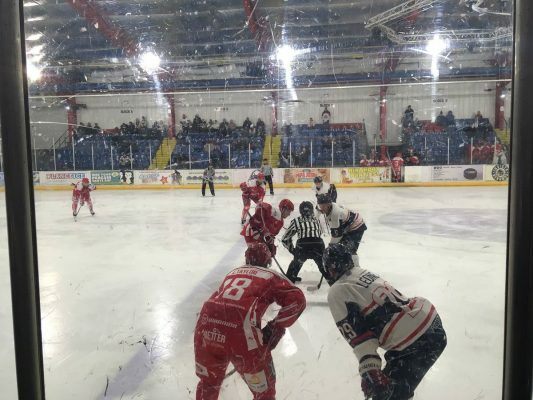 Invicta Dynamos ended their 2018/2019 season with a 13-4 home defeat against the Swindon Wildcats as they crashed out of the play-offs 24-5 on aggregate. Dynamos also bid farewell to long-serving owners Jackie and Andy Mason, who have ran the club for 22 years, as well as retiring defenceman Ondrej Zosiak. They were without the likes of Luke Thirkettle, Ryan Giles, Arran Strawson, Harrison Lillis and Connor Morris for the clash but did add Swindon netminder Tyler Perre between the pipes. Swindon were only missing import forward Jan Kostal. The first period opened with Swindon dominating the play. Andy Munroe received a two-minute tripping penalty which gave the Wildcats their first powerplay opportunity. Swindon opened the scoring with a powerplay goal at 7:03 from player coach, Aaron Nell.Not long after the goal, Munroe was sent back to the penalty box for a two-minute hooking penalty. Tyler Perre was called into action but was unable to hold a blue line shot which flew through a crowd of players. Chris Jones managed to force the puck into the net off of the rebound to double the Wildcats lead at 12.21. Joe Allen managed to produce a turnover in the neutral zone and the was alone with Michael Crisp. Crisp managed to save the shot with ease. Swindon lead 3-0 at 14:11 after forward Jones shot the puck from the top of the circles and it found the back of the net for his second of the night. Oskars Ancitis landed a huge hit on a Swindon defenceman, the puck was found by Lewis English who could not force it beyond Crisp. End of the first period and the Swindon Wildcats dominated the play and led 3-0. Second period begun with Sam Jones firing a shot at Perre which flew off the netminder’s shoulder. Goal four for Swindon came as the Wildcats set up in the Dynamos zone, a pass from Elliot Randall set up Lloyd Taylor for a close-range goal. Swindon led 4-0 at 23:22. Ondrej Zosiak tried his luck against Crisp with a close range shot but was unable to get it past the Swindon netminder. Swindon’s Randall was penalised for a two-minute hooking penalty. Nell on the breakaway sped past the Dynamos defenceman and shot the puck into the top left corner. Shorthanded goal for Swindon scored at 27:41 to give them a 5-0 lead. The Dynamos desperate for their first goal managed to pin Swindon in their own zone long enough for Callum Best to fire a hard shot through a crowd of bodies and it hit the back of the net. Goal one for the Dynamos scored at 29:18. Best with another quick goal from close range gave the Dynamos their second goal of the night. Goal scored at 30:53, which made the score 5-2 to Swindon. Swindon were quick to retaliate and scored their sixth goal of the night as Neil Liddiard shot the puck past Perre. Swindon led 6-2 at 31:46. Another fast goal from Swindon. Maxim Birbraer fired a one-timer from the slot into the back of net at 33:08. Goal eight for Swindon scored by Edgar Bebris. The Latvian-native redirected a shot from Birbraer and managed to beat Perre to make it 8-2 at 37:00. Anthony Leone travelled down the left wing, but his shot was sent wide by Crisp. Swindon led 9-2 at 38:27 as Toms Rutkis forced the puck from close range into the net. Munroe was sticked in the face in the corner and the Dynamo defenceman grabbed his face before skating to the bench with blood in his hands. No penalty called. End of the second period and the visitors led 9-2. Swindon pinned the Dynamos in their own end before Ben Nethersell fired a shot from the blue line and the puck slid under the glove of Perre. The visitors scored their tenth goal at 45:26. Straight off the face off Chris Jones scored his hat-trick with a close-range goal. Goal 11 scored at 45:26. A scramble in front of the Swindon net ended with Joe Allen forcing the puck from point blank range into the back of the net for his first goal of the season at 46.13. Matt Foord received a two-minute tripping penalty, which gave Swindon another powerplay opportunity. A shot fired from the blue line rebounded off of the pads of Perre, but Rutkis was there to collect the puck and flicked the puck into the net to make it 12-3 at 50:01. Randall received at two-minute high sticks penalty; however, the Dynamos were unable to make use of the powerplay. Owen Dell tried to score off of a rebound, but Crisp covered the puck. Dynamos were given a two-minute penalty for too many men. Powerplay for Swindon. Randall received a two-minute tripping penalty and the play was 4-on-4. Tyler Plews joined his teammate in the penalty box for a two-minute tripping penalty. The Dynamos were now on 5-on-3. Captain Leone managed to fling the puck past Crisp after a clean setup from Foord. Goal four for the Dynamos scored at 56:58. The visitors led 12-4. With less than two minutes remaining, the Dynamos tried to keep Swindon at bay but Rutkis managed to fire the puck past Perre at 58:45. Final buzzer and the game ended 13-4. Swindon Wildcats won comfortably and continue on into the playoff semi-finals. Invicta said goodbye to defenceman Ondrej Zosiak as he skated his last lap for the Dynamos and received a guard of honour. This entry was posted	on Sunday, March 24th, 2019 at 8:00 pm	and is filed under Featured, Ice Hockey, Other Sports. You can follow any responses to this entry through the RSS 2.0 feed. Both comments and pings are currently closed.